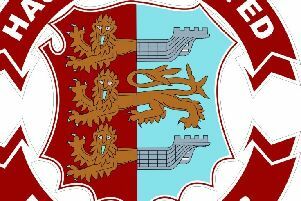 Bexhill United Football Club’s hopes of finishing in a promotion position suffered a significant setback with a draw against bottom two opposition on Saturday. The Pirates dropped points against a team from outside Southern Combination League Division One’s top five for the first time all season in a 1-1 draw away to Midhurst & Easebourne. What’s more, Midhurst - who would have gone bottom had they lost - played most of the match with 10 men after having a player sent-off 10 minutes before half time. Joel Kalambayi made his first start for Bexhill up-front in the absence of Drew Greenall, while Georges Gouet started out wide as Jack McLean was only fit enough to feature as a late substitute. With Bexhill kicking down the slope during the first half, the game started fairly evenly and although both teams tried to attack, chances were at a premium. Bexhill were slightly slower out of the blocks than in their previous two games. They struggled with their first touch and to get any kind of pattern to their play as Midhurst closed them down quickly. Midhurst opened the scoring with the game’s first genuine opportunity. Bexhill captain Craig McFarlane caught the back leg of a Midhurst player in the away box and Josh Sheehan smashed home the resulting penalty. The goal kicked Bexhill into life a bit. They started using their full-backs and wingers a bit more, and began to play a bit better. A few tackles were flying in and Midhurst number two Aaron Behan was shown a second yellow card for bringing down Kalambayi as he burst through. Bexhill fashioned three or four very decent chances during the remainder of the first half and Midhurst goalkeeper Joshua Bird pulled off two excellent saves, one of them from Jack Shonk’s close range effort. Liam Foster also had a goalbound shot blocked by a defender. Midhurst got plenty of bodies behind the ball in the second half and although Bexhill kept knocking on the door, it wouldn’t quite fall for them, often due to a poor touch or a good save. But they did equalise with one of their goals of the season. Following a cross from the right, Shonk executed a brilliant bicycle kick to send the ball flying past the goalkeeper. That really spurred Bexhill on, but the game was very stop-start and they couldn’t get any rhythm or momentum going. There were a few glimmers of hope for the visitors towards the end, but nothing clearcut and the game rather fizzled out. Bexhill remain third in the table, but are now four points behind second-placed Steyning Town with three games remaining. Bexhill: Rose; Holden, McGuigan, McFarlane, Ottley; J. Bunn, S. Bunn, Foster; Gouet (McLean), Kalambayi (Robertson), Shonk. Southern Combination League Division One top half standings (played-points): 1 Alfold 29-71 (+50 goal difference), 2 Steyning Town 29-70 (+48), 3 BEXHILL UNITED 29-66 (+62), 4 AFC Varndeanians 28-61 (+37), 5 Selsey 29-57 (+30), 6 Littlehampton Town 29-44 (+8), 7 Hailsham Town 29-39 (+6), 8 Mile Oak 29-37 (0), 9 Sidlesham 30-37 (-14).